I like cyberpunk. The last decade I have heard rumors claiming that cyberpunk is dead, but in my heart it lives on; The dark future, or alternative present, from Strange Days and Bladerunner is still as evocative as it was when I first encountered it in the early 90’ies. I pre-ordered Jeremy Keller’s new game Technoir (Named after the club in Terminator?) straight away when it came up on Kickstarter, and a few days ago I got the PDF in the mail. I don’t have the actual book yet, but the PDF is 214 pages in a small format, 5.5×8.5 perhaps. There are not many illustrations, but each chapter is preceded by very nice full page color illustration. The text is single column and pretty easy to read and there are lots of examples. The setting is cyberpunk, of course. There is not much information about the setting as such given in the game. Instead there are three sets of elaborate random tables called transmissions that can be used to generate environments around the PCs. The PCs are assumed to be criminals, or at least parts of the underworld in whatever city the game is set. Characters are built by selecting three previous occupations, each giving stat bonuses, making a few contacts and selecting some equipment. The resolution mechanic is centered around dice pools of D6s. There is an elaborate system for passing bonus dice from the players to the GM, when the players want to make lasting changes to their environment, and back again from the GM to the players, as he inflicts conditions upon the characters. There is no combat system as such, rather a system for conflict resolution that also involves violence as an option. Being dead is a condition the PCs can recover from. The form is traditional GM+players. The GM runs the world and the NPCs, and the players run their own PCs. There is a mechanic for integrating the PCs into their environment and binding them to the adventure through the transmission mechanic. The setting is OK. There isn’t really much setting in the game. I don’t think anyone will pick this game out of the shelf a few years from now to read the flavor text. But there are the seeds of your own settings in the transmissions. The rules are good, straight forward rules using a single main mechanic and some adjustments upon it to fit various situations. The form is very good, there are very clear instructions in the game for how to run it. If makes a good job of teaching it’s very own variant of fish tank adventures. Maybe, I don’t know if I can squish it down into a four hour convention slot without doing a lot of prep work in advance. And the prep is very much a part of the game. The choices the players make during char gen affect the setting, it would be a shame to rob them of that. If I just wanted to run a game of cyberpunk I would grab Teknochock. But I might borrow the transmission mechanic for adventure building for any traditional RPG. 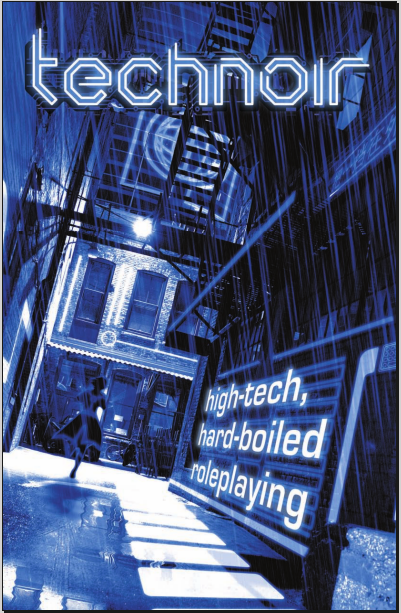 technoirrpg.com – The official Technoir site with lots of support material for the game. www.kickstarter.com/…roleplaying – The Kickstarter page for the game, now closed but the information still remains.